Scott Gordon is taking over on an interim basis. Scott Gordon doesn’t have the flashy resume of, say, Joel Quenneville, but he has had success with the AHL’s Phantoms and he will be given a shot to turn around the Flyers' frustrating season. Gordon, 55, was named the Flyers' interim coach Monday by general manager Chuck Fletcher, replacing the fired Dave Hakstol. Fletcher said his expectation is for Gordon to coach the rest of the season, and he called him one of the candidates to be the permanent coach. “I didn’t think it was fair to bring in somebody outside the organization on an interim basis,” Fletcher said. “What I like about Scott is that he has a history of success, particularly at the American Hockey League level. ... People I respect rave about his character, his preparation, his intellect. And I think the fact he’s been in the organization allows him to get up to speed quicker than bringing in somebody from the outside." Quenneville, who won three Stanley Cups with Chicago and is the second-winningest coach in NHL history, does not want to even consider coaching until after the holidays, a source said. Fletcher may pursue him in the offseason if he is still available. After the season, he will have a chance to stay. “The good news is we will have several months to work together,” Fletcher said, “and that’s going to be a lot longer interview than most people will have. 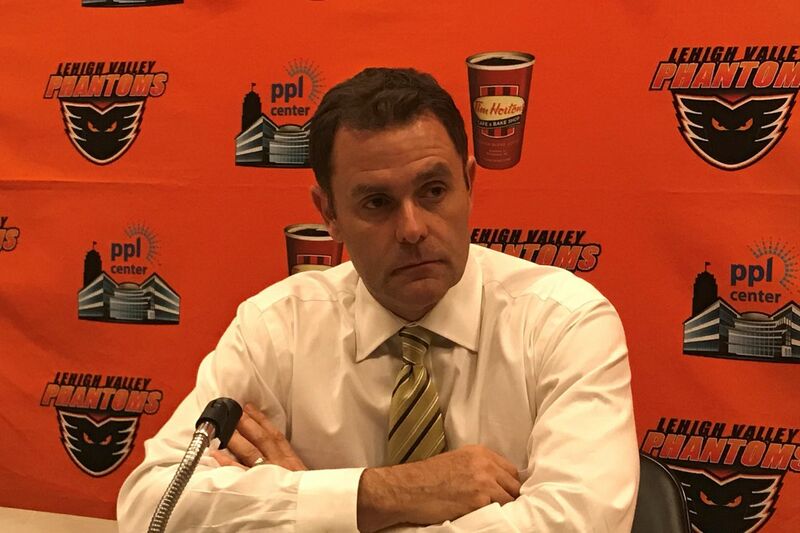 No promises were made, but I respect the job he’s done at Lehigh Valley. There’s a strong culture down there, the team works hard, they have success, and players have developed." Gordon coached Providence, the Boston Bruins' AHL affiliate, from 2002 to 2008, and his 2004-05 team lost to the then-Philadelphia Phantoms in the Eastern Conference finals. His 2007-08 team had the AHL’s best regular-season record (55-18-7). In three-plus years at Lehigh Valley, Gordon’s teams went 144-86-15, including 48-23-5 in 2016-17 and 47-19-10 last season, when the team reached the Eastern Conference finals. Eleven of the current Flyers, including those injured, played for Gordon with the Phantoms. Defenseman Travis Sanheim is one of them. The Phantoms were off to a 15-9-2 start this season under Gordon. Andrew MacDonald played for Gordon when Gordon was the Islanders' head coach. The Isles went just 64-94-23 in Gordon’s two-plus seasons as their head coach from 2008-09 to 2010-11. He then spent three years as a Toronto Maple Leafs assistant before taking the Phantoms job. “He’s a good man. He’s got good systems and I think he’ll do a good job for us,” MacDonald said. Fletcher is in the process of choosing an interim coach for the Phantoms, who temporarily named Kerry Huffman as their acting coach. ... Gordon, a Brockton, Mass., native, will join the Flyers for Tuesday’s morning skate in Voorhees. The Flyers host Detroit on Tuesday night. ... During Monday’s practice, which was held without a head coach, Nolan Patrick centered Claude Giroux and Travis Konecny. Patrick has one point in his last 14 games. ... Michal Neuvirth’s wife, Karolina, gave birth to a son, Marko.